Smale, Alan. 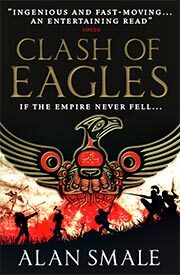 Clash of Eagles . Del Rey 2015. What if: Geta survived the assassination attempt by his brother Caracalla, and following civil war become sole emperor of Rome. Subsequently, Rome's "Crisis of the Third Century" did not occur and the empire avoided decline over the following centuries. 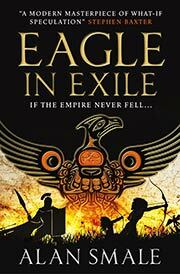 Series note: Series including Clash of Eagles , Eagle in Exile , and the forthcoming Eagle and Empire . Awards: Finalist: The series as a whole, 2017 Sidewise Award for best long-form alternate history. .
Smale, Alan. 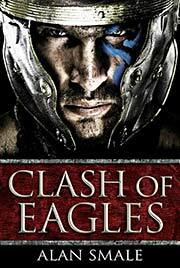 Clash of Eagles . Titan 2015. Summary: In 1218 CE, a Roman general captured by the Cahokians of New Hesperia introduces military and industrial technology to the tribesmen as their war with the Iriquois gets ever more deadly. Series note: First volume of the Hesperian Trilogy. Published: Del Rey 2015 (0804177228BUY, 1101885300BUY); Titan UK 2015 (1783294027BUY). 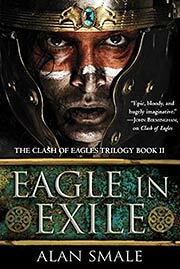 Published: Expanded from "A Clash of Eagles", in Panverse Two (ed. Dario Cirielo), Panverse 2010 (061537736XBUY). Awards: Original short story, Winner: 2010 Sidewise Award for best short-form alternate history. Smale, Alan. Eagle in Exile . Del Rey 2016. Smale, Alan. Eagle in Exile . Titan UK 2016. Series note: Second volume of the Hesperian Trilogy. Published: Del Rey 2016 (0804177244BUY) and Titan UK 2016 (1783294043BUY). Smale, Alan. 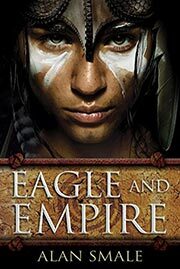 Eagle and Empire . Del Rey 2017. Series note: Third volume of the Hesperian Trilogy. Published: Del Rey 2017 (0804177260BUY); Titan UK 2017 (178329406XBUY).